Do you remember reading The Boxcar Children series as a kid? I sure do – I think I read every single book, and now I’m so happy that my son is going through the series, too. Who doesn’t love a good mystery?! 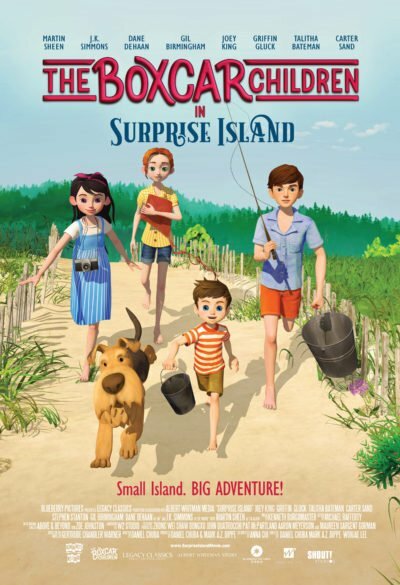 Now you and your kids can own The Boxcar Children – Surprise Island on Blu-ray and DVD! The film is based on one of the books from the beloved series by Gertrude Chandler Warner and is family-friendly for all ages, with a recommendation for kids 3-13. 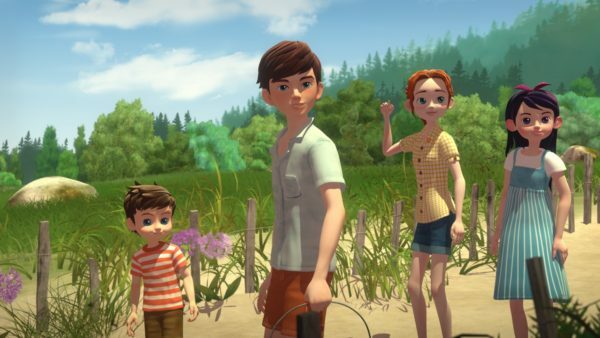 THE BOXCAR CHILDREN – SURPRISE ISLAND, the highly-anticipated movie adaptation of the popular children’s book of the same name, stars Martin Sheen as James Alden, J.K. Simmons as Dr. Moore, Dane DeHaan as the mysterious Joe, Joey King as Jessie Alden, Carter Sand as Benny Alden, Gil Birmingham as Lonan Browning, Griffin Gluck as Henry Alden, Stephen Stanton as Captain Daniel and Talitha Bateman as Violet. You can also enjoy some free printables for more fun at home! Make Violet’s ice cream recipe yourself, design your own museum to show off to friends and family, and print your own bookmark to keep your place in the book before you watch the movie. 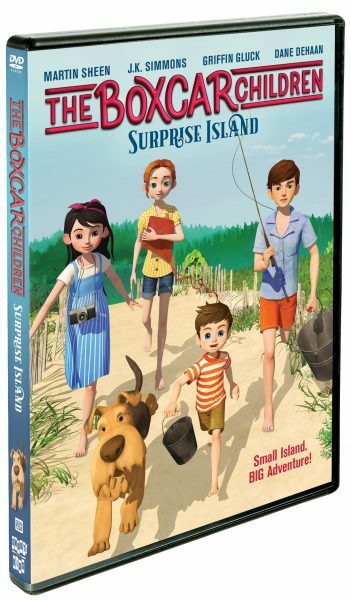 Reader Giveaway: Two lucky Jinxy Kids readers will win The Boxcar Children – Surprise Island on Blu-ray! To enter, complete the entry form below by 11:59 pm ET on 8/27/18. Good luck! My son would receive this. My nephew would get it. If i win this i will give this to my niece! I bet Jessie would be our favorite! I’d give this to my grandsons to enjoy! I never read this series as a kid. Sounds like a fun series though. My 7 yr old loves to read. She is just starting some chapter books. Looks like a great one for us to read together. I fondly remember the Boxcar Children from my childhood. I would love for my Granddaughters to enjoy them. I’m not familiar enough with the series to have a favorite — it’s been many years since I’ve read these books. I will be giving this to my granddaughter If I’m the lucky winner — she would really enjoy it. I’ve never seen or read the boxcar children, so I’d give this to my niece and nephew! Ive never read the books but my niece and nephew have and they’ll get this if i win. WHO wouldn’t want to win this great prize!! My daughter will be receiving this movie if I win. I will be giving the movie to my son and daughter. I also need to pick the books up for my son to start reading them. My youngest son would absolutely love this, he was so bummed when Netflix removed Boxcar Children from their line up. My grandson would love this! Benny is our favorite character. I could use this for my Pre-K class! My niece and nephew would get this. I’m unaware of these characters, but I will share this dvd with my 2 daughters. I really like Violet and I would give this to my nephew if I win. My niece would be getting this movie if I won. benny is my favorite. i was a big fan when i was a kid. I loved reading these books as a kid. Jessie was my favorite character. I know my youngest would enjoy watching this. Never followed this series before so no favorites. Violet Alden is my favorite. My nieces will be receiving this if I win! This would be for my three daughters. I don’t remember the character’s names, but I remember my mom reading these stories to me when I was little. I would give this to my grandkids. I did not read this as a kid but my daughter loves it. I would like this for my son! My son and daughter would be getting this. This movie would be for our granddaughter. My grandchild will receive this movie if I win.